When Chung Yeun-Bom was appointed to head the Seoul Office of the Japan National Tourism Organization (JNTO) earlier this month, he inherited the arduous task of promoting tourism to the Japanese mainland in the wake of the tsunami and the Fukushima nuclear disaster. In June, tourism plummeted by 36 percent as Japan continued to suffer the residual effects of the catastrophe, and despite massive discounts on hotel rooms and tour packages, the road to recovery has been slow and painful. Nevertheless, Seoul’s new JNTO director remains determined to revive Korean tourism in Japan, and his unique ties to both countries may put him in prime position to accomplish his ambitious agenda. Mr. Chung is of Korean descent but was born and raised in Japan and speaks Japanese, Korean and English fluently. He graduated from Japan’s Keio University with a degree in economics before moving on to Yonsei University's Graduate School of International Studies in Seoul. Chung also has extensive experience working with the JNTO, including key positions as an assistant director of the JNTO’s New York office in 2003 and as the main office’s senior assistant manager for research and planning in 2008. As Seoul’s JNTO director, Mr. Chung hopes to utilize his experience and multicultural perspective to promote tourism between South Korea and Japan through cultural ties and via “tourists as ambassadors.” Indeed, Korea and Japan have witnessed periods of increasing cultural exchanges in recent generations. As the Korean Wave and the K-pop invasion began to hit the Japanese airwaves around the turn of the century, so too did Korean tourists begin to flock to Japan in ever greater numbers; in 1998, only about 700,000 Korean tourists visited Japan, but by 2010 the number had skyrocketed to 8.6 million, placing Koreans atop the Japanese tourist market at 28 percent of all tourists. The following is the full text of the questions and answers. Q1: First, I would like to congratulate you on your new position as the director of the Japan National Tourism Organization’s Seoul Office. I believe that your educational background and extensive experience at the JNTO demonstrates your ability to successfully lead your tourism organization. As the new director, what is your first major objective? 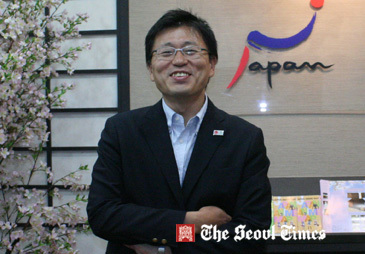 A1: First of all, our goal is to revive tourism in Japan as quickly as possible. Demand has been very low since the tsunami struck the eastern part of Japan. It was in 2003 that I started my overseas work at the JNTO’s New York office. That was exactly when SARS (Severe acute respiratory syndrome ) was rampant. The demand for tourism to Asian regions from the United States was very low at the time. However, this time the problem is more serious and I guess it will take an even longer time now. I would like to use my previous experience to overcome the current situation, and I will do my work in a quiet way. Q2: How important is South Korean tourism to Japan? What are the major objectives of the JNTO for the South Korean market? For Japan, South Korea is the largest market. In 2010 some 8.6 million foreigners visited Japan. Among them were 2.44 million South Koreans. They account for 28 percent. After that, people from the Chinese mainland accounted for 16 percent, the Taiwanese constituted 15 percent, and 8 percent were Americans. Currently, the JNTO is instituting a variety of promotional activities to double or triple the number of incoming foreign tourists. Q3: Please tell me about your plans to further promote tourism among the Korean people and in the Korean market. What are some of your long term goals during your tenure here in Seoul? A3: Our long-term goal is to increase the overall tourist exchange between Japan and South Korea to 10 million people. It was 5.46 million in 2010, when 2.44 million South Koreans visited Japan and 3.02 million Japanese came to Korea. Presently, there are over 400 flights per week between Japan and South Korea. A total of 135 cities and municipalities formed sisterhood relations between the two neighboring countries. There are also a countless number of tour and travel products for sale in South Korea. Ultimately we want to take a step by step approach to achieve our goal of securing the 10 million person tourist exchange between the two nations on the basis of firm and close bilateral ties. Q4: What entices South Korean tourists to visit Japan? A4: Food, spas, and nature are attractions, I believe. Young South Koreans are also interested in the modern culture of Japan. I recently found that South Korea is the No. 2 nation in the world in the per capita consumption of seafood and Japan is No. 3 (for your reference Iceland is the No. 1 nation and Norway is No. 4). Both Japan and South Korea have at least one thing in common: both peoples favor eating seafood. South Koreans love to eat Japanese food such as raw fish (sashimi), sushi, noodles (udon), pork cutlet, and ramyon (instant noodles). Since a few years ago, there has also been a boom for traveling to Korea amongst the Japanese. They are highly interested in eating Korean dishes. Q5: What is needed for the South Korean tourism industry to be further promoted or developed? Do you have any suggestions or recommendations for the South Korean government or its people? A5:I arrived in Seoul from Japan just a couple of months ago, but I believe that the structures of the tourism industries in Japan and in Korea are not very different. I heard that there are over 10,000 companies involved in the tourism industry in South Korea. Among them we would like to work with companies that can share the same values as us. We want to have a win-win situation with South Korean companies. To achieve this, the JNTO needs to expand the demand and South Korean companies can increase the number of tourism products according to its demand: if the supply is increased while the demand remains constant, price competitiveness will fall. At that point, many tourism companies will be in trouble. Additionally, South Korea is more advanced than Japan when it comes to the area of tourism marketing, so I will have to study the field more. Q6: Could you tell us about your professional background? Why did you enter into the tourism industry and on what occasion? A6: I began to pay attention to the tourism industry naturally, which was my main reason to work for the JNTO. Furthermore, I studied economics at the undergraduate and graduate level. At that time people talked a lot about the phrase “Tourism is a passport for peace.” I like the phrase because I agree with the concept. As people travel to foreign countries they come to understand them more deeply, so misunderstandings will gradually diminish. I have Korean ancestry, so whenever South Korea-Japan relations worsened in the past it hurt me a lot. In many Asian countries, tourism is the major industry that supports its economy, yet people failed to pay heed to the economic effects foreign tourists might have brought to 20th century Japan, which based its economy on the manufacturing industry. I believe that the tourism industry is very important to Japan, which is the second reason I chose to work for the JNTO. 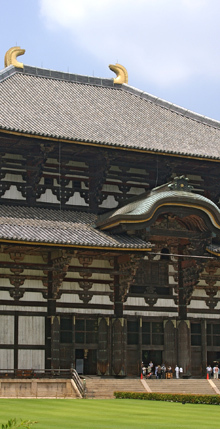 Tōdai-ji (東大寺) or literally Eastern Great Temple, is a Buddhist temple complex located in the city of Nara, Japan. Its Great Buddha Hall (大仏殿), the largest wooden building in the world, houses the world's largest bronze statue of the Buddha Vairocana, known in Japanese simply as Daibutsu (大仏). The temple also serves as the Japanese headquarters of the Kegon school of Buddhism. Q7: I suppose that you have many foreign friends from numerous countries. How do you rub shoulders with them? Tell me your secrets of making good friends with them. A7: In Seoul as well, I would like to make many friends from other countries in addition to Korean and Japanese people. I want to enjoy my life with them. I would like to treat people with an open mind irrespective of their age, race, or whatever. Q8: Could you tell me about your future plans? You have been rising within the JNTO quite successfully. What is your next step as a tourism expert? A8: I would rather not talk about my distant future. Anyway, I would like to focus on reviving the tourism market now in recession. Q9: Please tell me about your hobbies. How do you spend your leisure time? Do you exercise for health? A9: I love to play soccer with my son, who is attending primary school. I normally enjoy soccer with him on the weekends. I even acquired an official license as a soccer referee and I served as a referee in my son’s soccer games. Right now my family is in Japan, so I choose to go and see soccer games in the K-League. I already watched FC Seoul’s game. When I was a student in Seoul my favorite soccer player played for that team, and now he is serving as FC Seoul’s coach. Time flies in my life as well. From now on I would like to make more Korean friends. I want to enjoy mountain hiking with them. Also, I would like travel to many places in Korea and gain various perspectives on how Koreans enjoy traveling. A10: As I mentioned, I am married to my wife and have one kid who goes to elementary school. They are in Japan now.